From the far-east to Belfast that's where Johnny ‘Swift’ Smith’s challenger will travel from. The 21 year-old Yuhei Tsuda, from Tokyo has 20 fights under his belt. Japanese fighter confirmed for Belfast. 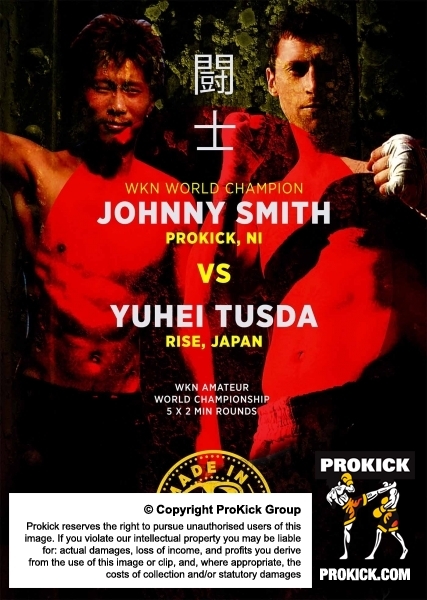 Johnny ‘Swift’ Smith’s next opponent will be making the long journey from the home of K1 fighting sport – Japan. From the far-east to Belfast that's where Johnny ‘Swift’ Smith’s challenger will travel from. The 21 year-old Yuhei Tsuda, from Tokyo has 20 fights under his belt and will arrive in Belfast hoping to dethrone Bangor's ProKick homegrown world champion and take the WKN world amateur title home to Japan. It can be expected that Yuhei Tsuda will step into the ring on June 14th with speed, endurance and flair. At 5 ft. 10 inches and well conditioned, Tsuda is a great match for the determined, dedicated and dynamic Smith who is at the cusp of breaking through to professional kickboxing. This will be Johnny’s first defense of his World Title that he won by KO at the Ulster Hall in September 2014 when he faced Hakim Ketaieb of France. Smith now 28 years-old has also an impressive fight record, he's went through the ropes on 22 occasions, fighting all over the world as far as Japan. This is sure to be an all-action affair as soon as the first bell rings. Tsuda will bring his Rise/Japanese style of kickboxing to the ring attempting to take Johnny’s World Title, while you can be sure that ‘Swift’ Smith will be just that - swift, sharp and focused. If you haven’t already got your tickets, what are you waiting for? This is a fight not to be missed! Also joining Smith on the semi-main event - It's the return of the MAC, aka Cathy McAleer. She is one of Ireland's most successful female Karate competitors, and she too will go between the ropes as part of her campaign to become a WKN world kickboxing champion. Billy Murray said this earlier today: "We had a great event in March where Cathy won a WKN Full-Contact amateur European title and the rest of the team done exceptionally well also, so I'm looking to keep our fighters busy when they are still on a high from our previous show. This is such a honour for us in Belfast to have one of the RISE team travel and compete in Belfast it really show the world that Belfast has fighters to match the best in the world. I'm really excited about this match." The undercard will be made up of various other fighters from the gym, most of whom fought at the "Total Divas and The Undercard" sell out show in March. And there will also be a few fighters having their debut in the ring which concludes what is shaping up to be a real good event. A big thanks to Mr Cabrera & RISE Japan for making this match.